USS Ronald Reagan Strike Group Deploys. 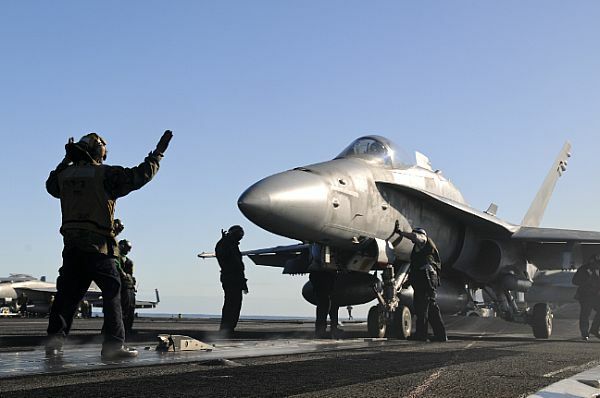 The picture is of an FA-18E Super Hornet assigned to The Argonauts of Strike Fighter Squadron One Four Seven. Soft spot sort of. I was an Argonaut from November 1985 to June of 1987. We were an Attack Squadron back then flying the Venerable and Legendary A7E Corsair II. SLUF was it’s nick name. Short Little Ugly Fucker. 147 was the first A7 squadron to see combat in 1967 embarked in USS Ranger. We were in CVW-9 back and up until recently for the Hornet version of the Squadron. Navy can’t leave anything to tradition anymore for some stupid reason. I also remember when 154 was flying the F4 in CVW-2 on Ranger when I made my first West Pac in 1979. Geez your old jokes are now OK! Argonaut Super Hornet on the Catapult!